It has been suggested that the H1N1 Flu vaccine causes miscarriages (see, for example, here, here, and here). This month, I want to see if the claim is supported by VAERS data. How do we determine whether a VAERS event resulted in a miscarriage? VAERS uses the MedDRA symptom classification, which organizes all known symptoms at five levels of detail. At the second level of detail is an entry "Abortions and stillbirth" which has under it "Abortion related conditions and complications", "Abortions spontaneous", "Stillbirth and foetal death" and "Abortions not specified as induced or spontaneous". Each of these is further refined into specific symptoms. So it seems that this second-level term (or as it is known in MedDRA, the High-Level Group Term or HLGT) is a valid way to identify miscarriages. Now let's search all of the VAERS events (going back to 1990) for this symptom and make a graph of the vaccines listed in those events. To do this, check Expert Mode (to enable MedDRA searches), click Show Graph and graph Vaccines (in Section 1), and select the MedDRA level HLGT under the symptom list and then select Abortions and stillbirth (in Section 2). This graph will surely favor vaccines that have been given for 21 years over those that have been recently introduced, because such vaccines will have been given much more, and so will have produced many more symptoms. In other words, this graph should de-emphasize the H1N1 Flu vaccine, which has existed for just one year. We should see relatively few H1N1-related miscarriage events compared with the "Seasonal" Flu vaccine which has been administered to many more patients. The results are shocking. First of all, the H1N1 Flu vaccine has appeared in miscarriage events more often than almost any other vaccine. Of the 1115 VAERS events that mention the abortion/stillbirth symptom, 203 are cases where the H1N1 Flu vaccine was given (200 with the FLU(H1N1) vaccine code and 3 with the FLUN(H1N1) vaccine code). This ignores the current Flu vaccine being given which has the H1N1 strain in it (the FLU(10-11) vaccine code). 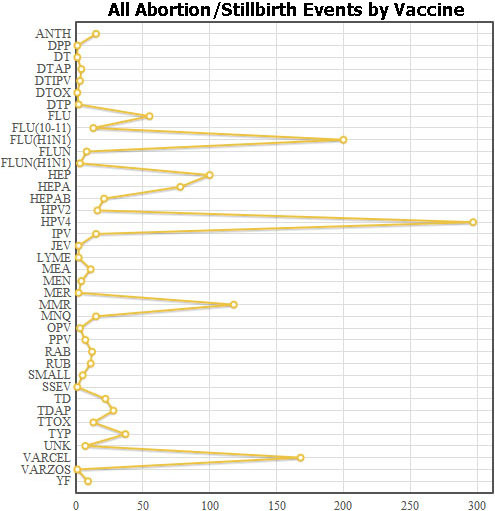 By contrast, there are only 63 abortion/stillbirth events associated with the Seasonal Flu Vaccine (vaccine codes FLU and FLUN) and this vaccine has been administered to millions of people over 21 years of data collection! If you consider that the H1N1 Flu vaccine has been associated with 3 times as many abortion/stillbirth events, and that it has been given for just 5 percent of the time that Seasonal Flu vaccines have been given, then it appears that the H1N1 Flu vaccine is 60 times more likely to cause a miscarriage than the Seasonal Flu vaccine. But the graph has more shocking results for us. The H1N1 Flu vaccine appears in many of the abortion/stillbirth cases, but not the most. The "winner," appearing in 297 of the VAERS records associated with miscarriage, is Gardasil (vaccine code HPV4)! Once again, this vaccine is a newcomer, having only existed for 4 years. So pregnant women should read the product manufacturer's insert for the vaccine they are considering and speak with one or more trusted health care professionals before making a decision about vaccination during pregnancy.